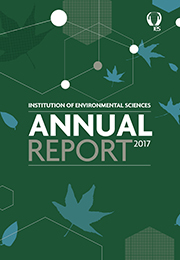 Application to the Institution of Environmental Science is carried out through a paper-based review process. Applications are assessed by a membership panel which convenes approximately once a month, and is made up of IES Council members. One application form covers Full and Associate Membership. There are separate forms for Fellowship, Students and Affiliate applications. Please download the relevant form, and read though it carefully, before sending it to the Institution. Applications to the IES are graded on a points system, with the total made up from a combination of academic and work experience. The final decision on the appropriate membership grade will be with the Application Review Panel (ARP). Points are determined by the highest relevant qualification e.g. PhD 'trumps' a Masters degree. The IES automatically awards relevance if the course title is included in our list of approved environmental science courses which closely aligns with the ES3 Benchmark Statement as well as aspects from other related QAA statements. There are some additional degrees not mentioned on this list that may be considered relevant at the ARP's discretion. However, for courses not listed, applicants may provide justification for how their academic experience has directly furthered their understanding of environmental science, which may lead to the determination of relevance by the assessors. International qualifications should be translated into their UK equivalents. Years (and therefore points) accrued whilst in relevant employment signals experience, commitment and achievement in the environmental science sector. Applicants therefore must demonstrate how their work is aligned to the sector. ½ unit for every six months relevant work experience at graduate level. Relevant university placements may count towards your work experience. The ARP can award points for partial relevance, e.g. a Health and Safety & Environmental Officer may be awarded 1 point for every 3 years work. For graduates from courses accredited by the IES to apply for Associate Membership at a discounted rate. Lays down the rules of professional conduct that all professional members need to abide by. The countdown clock on the website shows the date of the next application review panel meeting. Candidates are normally contacted within a few days of this meeting. The IES uses the ES3 Benchmark Statement from the Quality Assurance Agency (QAA) to judge the relevance of degrees. International qualifications should be translated into their UK equivalents. There are some additional degrees not mentioned on this list that will be considered relevant at the ARP's discretion. Candidates who degrees do not appear on the list should submit a paragraph explain how they use the learning from their degree in their current job. For work experience the ARP are looking for environmental science or sustainability content. The ARP can award points for partial relevance, e.g. a Health and Safety & Environmental Officer may be awarded 1 point for every 3 years work. Can I apply for Chartership at the same time? No. You must achieve Full Membership of the IES first, as this denotes the entry criteria for the designation. If you are confident that you meet the criteria you can begin filling in your application for Chartership while you await the result. How do I apply to re-grade? Please use the re-grade form which is available to download from the Members' Documents page. How do I maintain my membership once I've joined? Membership will be maintained by paying your annual subscription each year in January and abiding by the Code of Conduct and CPD reporting requirements. I was previously a member of the IES, can I rejoin? The IES rules allow career breaks of up to 2 years without the need for the candidate to reapply. These individuals can rejoin by simply paying the current year's subscription. For those individuals who have been absent from the IES for longer than two years, they will need to reapply using the Re-joining Form. Each IES member has a grade suited to their experience. 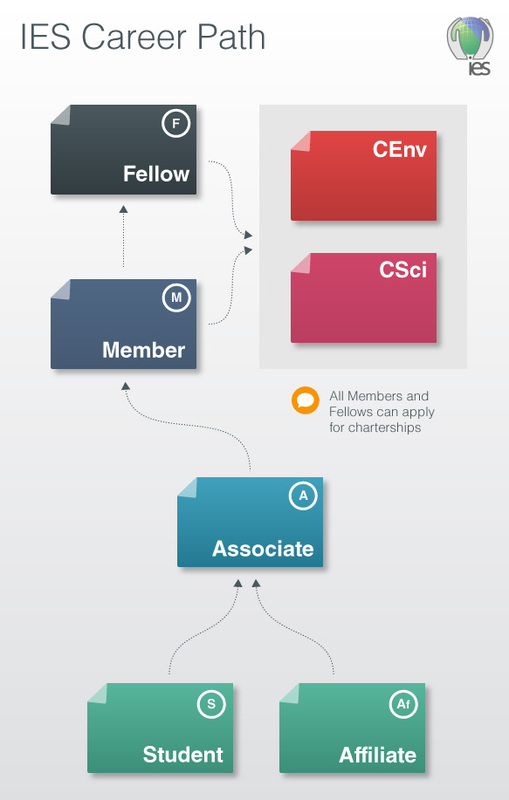 Fellowship is appropriate for esteemed individuals in the fields of environmental science and sustainability held in high regard by their peers. Fellowship is the highest level of professional recognition offered by the IES and is awarded in recognition of a candidate’s exceptional academic and professional standing. Full membership is a professional designation for those working in the field of environmental science, which confers that you have reached a certain standard within your career. This grade is for individuals who have achieved the professional experience comparable with chartered status in other professions. For individuals who hold a relevant degree or equivalent qualifying experience. You might be someone who has finished university and is starting out in the environmental sciences sector or someone later in their career but whose job is only partially environmental science-based. Affiliate membership is for individuals with an interest in environmental issues but who don't work in the field. You might be someone who wants to support the voice of environmental science or a student undertaking a non-accredited environmental degree. Members of the public are encouraged to join, signalling their belief in the application of science and professionalism as a way of tackling environmental challenges. Students who are enrolled on the Institution of Environmental Science’s accredited undergraduate or postgraduate programmes may apply for the special grade of Student Member of the Institution.